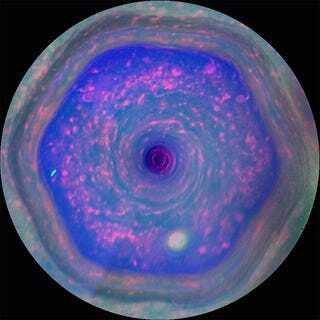 Add this to the long list of celestial End Times portents to keep you up at night: Saturn’s north polar hexagon, a six-sided vortex of unknown origin that could easily swallow our entire planet, has changed color. It was blue when the Cassini spacecraft imaged it in 2012, and now, it’s bright gold. The surprising new hue is plainly illustrated in a set of images captured in November 2012 and September 2016, and released by the Cassini Imaging Team last week. While scientists are still working out the details of what triggered the color change, it seems to be related to the accumulation of haze particles inside the hexagon since winter’s long night ended. From November 1995 to the winter equinox in August 2009, Saturn’s north pole was tilting into darkness. During this time, photochemical reactions—interactions between sunlight and atmospheric compounds that produce haze—were diminishing. And since the 100 kilometer-deep hexagon acts as a sort of particle barrier, aerosols weren’t able to filter back in from elsewhere, resulting in something “like Earth’s Antarctic ozone hole,” as Kunio Sayanagi of the Cassini Imaging Team put it in 2013. Since 2009, the north polar atmosphere has been angling back towards the Sun again. Scientists suspect this is triggering a fresh new round of haze production. “The change from a bluish color to a more golden hue may be due to the increased production of photochemical hazes in the atmosphere as the north pole approaches summer solstice in May 2017,” NASA wrote in a statement. It’s worth noting that this incredible shift was only documented because we’ve had a probe orbiting Saturn since 2004. As Cassini gears up for its final, action-packed year of activity, it’s worth remembering just how many cosmic wonders this little spacecraft has brought us. We’d be lucky to get another mission like it.